1. Tremendous tribute video for the late, great William Moody/Paul Bearer. It’s the same one they released over the weekend and honestly I don’t think they could have done it any better. The Undertaker’s appearance (minus the “Shredder” coat finally) was perfect. The urn in the center of the ring, the image of Bearer on the TitanTron and the genuine emotion on The Undertaker’s face sent chills up my spine. Then there was CM Punk’s interruption. Now A LOT of people expected this to happen after he & Paul Heyman mocked Jerry Lawler’s heart attack so while the shock value wasn’t there, the execution was. It was short, to the point and gave The Undertaker fuel for his match against Punk at WrestleMania without ever having to wrestle a match. Get ready for a good 4 weeks of promos and CM Punk vs Kane matches. 2. Daniel Bryan vs Dolph Ziggler continues WWE’s 2013 streak of a great in-ring matches. And not only was it a very good technically match but it made storyline sense after last week’s SmackDown. Plus it finally gave Dolph Ziggler a win on TV. Hopefully this is a start of a new winning streak for the Money In The Bank winner and it’s about damn time. 3. DAMN! I really wanted to see the New Age Outlaws vs The Rhodes Scholars match since they have been getting such good reviews during live events but this angle made perfect sense. And it didn’t even cross my mind that Brock Lesnar would attack the two former D-X members in a way to get at Triple H but it was logical and made for great TV. I have to admit, the WWE seemed to have little to absolutely no direction for WrestleMania last week and now things look to be smoothly flowing together for the big event in 4 weeks. 4. Did anyone really expect the Bella Twins to be gone long when their both dating WWE stars (John Cena & Daniel Bryan)? 5. As much as I enjoy the tag team of The Rhodes Scholars, they did not need to be in two matches tonight on Raw. And what was the point of Cody Rhodes hitting on Kaitlyn in a very babyface-like manner? They’re re-establishing this HEEL tag team who JUST reformed together and already we see that one member is showing babyface tendencies towards the babyface Divas Champion? Strange booking but I guess that’s what you get when the only heel Divas on the roster are Tamina & Aksana. 6. So Chris Jericho doesn’t have a match at WrestleMania (or even a potential opponent) and now we’re getting “movie star” vs “movie star” in The Miz vs Wade Barrett? It’s not awful but it’s not very good either. 7. Boy that was a clusterf*ck of a segment. First the TV disappears. There’s not chairs/stools. Jericho somehow ends up holding Miz’s upside down “WWE” logo microphone. And then Brad Maddox comes out to turn the entire thing into one of the worst debacles Raw has seen in years. This show DOES have writers, doesn’t it? 8. Wade Barrett vs The Miz vs Chris Jericho for the Intercontinental Championship on next week’s Raw and Mark Henry vs Ryback on this week’s SmackDown. What the hell is up with giving up potential WrestleMania matches just weeks before the biggest event of the year? 9. Loved Kane’s entrance with the urn and the pedestal it was placed on at ringside. 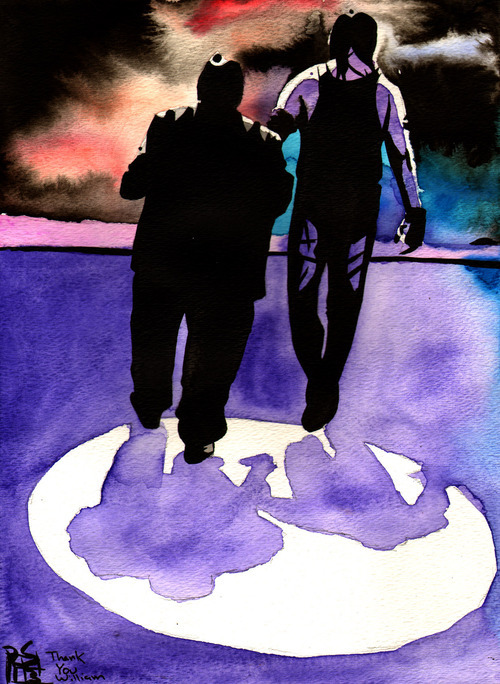 You know it’s going to factor into the match somehow but just having that little piece of Paul Bearer at ringside for Kane’s match and not just for the Undertaker really made sense and probably meant a great deal to Glen Jacobs. 10. The clean finish over Punk didn’t bother me one bit considering the theme of the show. Plus, Punk got his heat back almost immediately while also allowing The Undertaker & Kane to pay one last homage to Bearer. The attack with the urn was predictable but I think it worked. The urn is the symbol of Paul Bearer. He carried in the WWE for every superstar he managed from Mankind to Vader to The Brothers Of Destruction. But it’s also a WRESTLING symbol. That isn’t the real urn that William Moody’s ashes would reside in if he would be cremated. The urn only related to the Paul Bearer, Kane and Undertaker characters so it makes perfectly logical sense that CM Punk would try to use it to get into the mind of the unbeatable man he’s facing at WrestleMania. William Moody’s death is untimely, horribly sad and he is truly a loss to any one of us who calls ourselves wrestling fans. But I am in no way offended by this angle as it lightly focuses on the personal relationship of Mark Calaway and William Moody but it appears as if it will be much more focused on the storyline relationship between The Undertaker & Paul Bearer.